The most prominent characteristic of this album is its dullness. Knowing that there are countless enthusiastic reviews and other references to Sol Invictus as a key element in a third-camp post-racial, culturalist neo-fascist scene or network, actually listening to this fascist subculture star is utterly disappointing: although the man seems to cultivate an aura of mildly dangerous ambivalence around himself, there is not a hint of charisma, nothing drastic, provocative or mysterious, or at least interesting, in the music. One might expect that the man who heroically throws the gauntlet down to ‘the modern world’ will produce something powerfully out of step with this modern world and its culture industry; not so. This postmodern leader’s voice is weak, nondescript, hardly memorable, the singing is monotonous, emotionless, on most of the live recordings off key (in the context of entirely tonal music). Perhaps this is part of the logic of what is going on here: this is your fascist-next-door, a totally ordinary bloke, and as such perhaps allows his fans who long for redemption from modernity to project their own phantasies of power and empowerment ‘against the modern world’ on this entirely neutral man (whose consistent use of Latin phrases indicates, though, that he nevertheless partakes in the world of the educated). The production is sterile, lacking any particular musical idea, the quality of the performances is mixed, some musicians being better than others (the drumming is particularly poor). The musical style is eclectic and comes with its own label, ‘neo-folk’, which is just as well: this band would survive neither in the context of folk, where musicians are expected either to actually command a rich tradition or to not command it in an interesting, individualistic way, nor in the context of industrial music where some extent of sonic inventiveness is required. ‘Neo-folk’ (well, this CD anyway) has none of these, it is just bland. It shares its ordinariness, sterility and the threadbareness of the cheap tricks of its production – lots of reverb etc. – with, say, Christian pop music. So little can be said about the music and its performers that it has to be assumed that the main power of attraction lies in the lyrics (again, like in Christian pop). What does this fascist (sub-)pop star sing about, then? The album opens with Angels Fall, the most lyrically complex of the songs on the album. The first verse of the song – and of the album – sets the scene in rather dystopian terms: ‘There’s a grey army at the door,/They drag us down, are the rulers of us all./ Their poison seems to seep through the walls,/Through the dustbin worlds they crawl’. The most important image here is that of the door: there is an outside the door, where the grey army rules, and an inside where the speaker (the singer?) is located, apparently without doing anything but watching and thinking. ‘They’ (the grey army) ‘drag us down’ and rule us, i.e. they are powerful, but they are also despicable lowlifes as they ‘crawl’ like worms ‘through the dustbin worlds’.5 Their poison ‘seems’ to seep ‘through the walls’, but it has apparently not quite yet penetrated into the safe inside space from where the song is articulated. The chorus of the song is a bit unclear: ‘But I thought I heard you call,/ Then watched the angels as they fall.’6 While the first and also the second verse are set in the present tense, the chorus and the third verse are in the past tense (except for the word ‘fall’ in the chorus, but that is probably only to make it rhyme with ‘call’; grammar was here sacrificed on the altar of rhyme). The past tense narration gestures at a vision: the speaker thought he heard a person (‘you’) call, then he thought he saw a ‘burning light’ and he saw angels fall. The angels ‘fall into the night’ and die ‘with their god’: ‘their god’ clearly is not accepted as a god by ‘us’, i.e. the speaker and the person the speaker addresses as ‘my friend’; ‘we’ may have other gods, or none at all. The disappearance of the world of the angels, ‘their god’ and the poisonous ‘grey army’ (and the dustbins, too, perhaps) would liberate whatever is inside the door that is mentioned in the first line, apparently a realm that has managed to resist and might possibly outlive the world that is now disappearing. Strangely, the second verse states that it is sad that ‘we’ will witness ‘the coming of the end’ and the fact that ‘it’s all falling apart’. The ending of the dystopian world of the ‘grey army’ should be celebrated, one might have thought; the sadness might point to the fact that the speaker knows that, unlike the angels and ‘their god’, the grey soldiers might not leave without putting up a fight, and the ending of the present world, heralded by the falling angels, might be a rather violent affair. The fact that ‘we shut our eyes and we try and laugh’ could mean that we are in denial of that violence; we are ambivalent about the ending of the existing order. On first reading, Angels Fall is a rather clumsy and silly piece of second-hand romanticism; a clichéd piece of end-of-the-century despair, a school boy’s pastiche of The Doors’ The End, perhaps. If we put it into context, however, and follow, in particular, the reading of Sol Invictus as belonging to the tradition of ‘apoliteic’ cultural fascism,7 it can be decoded as a rather clever piece of fascist propaganda. The song reaches out and embraces – offers consolation and encouragement – to its target audience of people who feel ambivalent about the modern world (and quite rightly so – who doesn’t?). It does not rouse to action but remains entirely contemplative, while stuff happens: god dies, angels fall, the end comes. This makes it the perfect song to open the album – unthreatening, agreeable, ambiguous. The spatial metaphor of a realm inside the door and inside the walls that just so still manage to keep out the ‘poison’ stemming from the ‘grey army’ that rules outside reflects the positioning of the fascist intellectual who, after the defeat of political fascism by the grey armies of Stalin and Roosevelt,8 sits in hiding waiting for better times, scanning the night skies for a sign. Has the sign perhaps come already? We don’t know – the speaker/singer ‘thought’ he had seen something (angels fall), but maybe they have not fallen yet. Better to keep the guard up and not give away the game quite yet. The next song is called Long Live Death which is of course the English translation of the Spanish fascist slogan, ‘Viva la Muerte’. This song evokes a sort of metaphysical sense that death and dying are normal and natural, eternally occurring events and combines it with a more specific sense that ‘the modern age’ is about to be destroyed as it deserves to be, and that this will lead to a resurrection of ‘the ancient dead’ (which contradicts the idea of eternal death – apparently, death can be reversed!). Casually thrown in is the notion that ‘the serpent … coils the world’, which might explain the resurrection of the ‘ancient dead’. Two statements are made on ‘the modern age’: it is ‘a game of charades’, and in the course of these ‘the best [are] drowned out by the mass’; this seems to imply that modernity – democracy, presumably, as the reference to ‘the best’ defends some form of aristocracy – is also really a form of murder that drowns out ‘the best’. The death that is modernity is about to be evened out, though, when ‘cities [will] burn’ and ‘on the ash tree bodies swing in the breeze’. The song ends with a more concretely activist line than the previous ones: ‘Beneath a pagan moon swords rise with runes’. The characteristically contemplative and distanced tone is maintained, however, by making ‘swords’ the subjects in the sentence: swords simply ‘rise’, they are not raised by anyone in particular. Track 5 is called A Ship is Burning. This seems a bit of a filler as it does not do much more than repeat one of the motives of Raven Chorus: someone watches a scene of a lost battle, there are ‘tear stained eyes’, but some form of resurrection is expected: ‘The king is dead but a phoenix will arise’ (note: as this was released in 1988 this is obviously not a reference to Conchita Wurst). Meanwhile there are voices calling ‘you’ (the listener), namely the voices ‘of those who came before’ whose names can be found ‘on ancient stones’ etc etc… . The poet does not share with us what the voices have to say but we can assume they oblige us to continue the struggle that those whose voices they are have died for. The final studio track is a somewhat more dramatic offering, titled (on the CD cover) Wolf-Age, Axe-Age (although elsewhere it is titled This is the way), and features in the background two voices chanting ‘wolf age’ and ‘axe age’ respectively, in the last part of the song also repeating phrases from the vocals in the foreground in a sort of call and response mode. This is clearly the musical highpoint of the 1988 album, ending in a rather dystopian collage of voices and noises ending in repeated incantations of the key line, ‘With cold heart and bloody hand/ They rule the European land’. 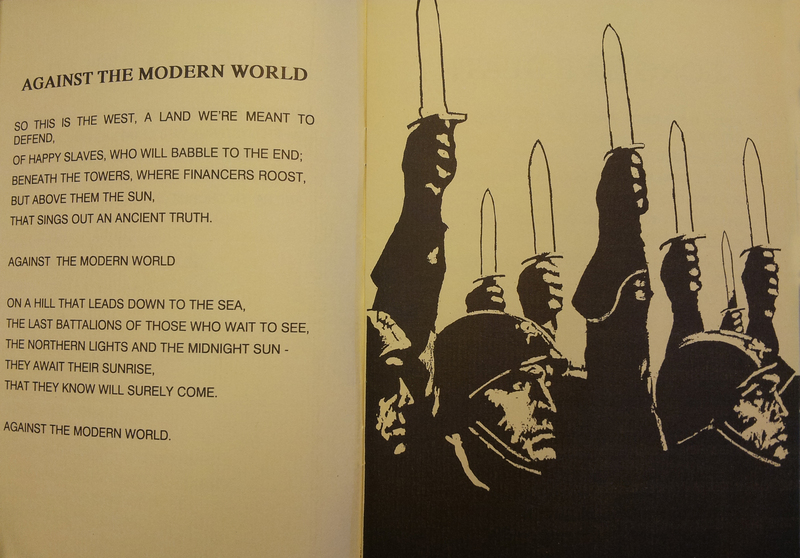 The CD booklet gives only a small part of the text of the monologue but the lyrics seem to describe a world where everybody fights everybody, it rains a lot, woe and wantonness abound, people drown in the sea, which are apparently all metaphors for the current situation of a Europe governed by brutal, cold-hearted people. (Thinking about it, this is a rather silly complaint coming from an admirer of Julius Evola’s aristocratic-cultural fascism which is exactly opposed to what Nietzsche would have called the slave-morality of bleeding-heart liberalism… what’s wrong with a cold heart and a bloody hand from the perspective of the warrior- and honor-based, anti-Christian, heathen elitism of a follower of the Invincible Sun, a warrior cult?) Again I have not managed to understand all the words that are actually on the recording – there is clearly more on fighting: giants and witches are mentioned, heroes are dying and go to a place where they meet Odin… that kind of thing. The first song on the live section of the CD is The World Turns. This song asserts that ‘the West is dead’ and that ‘you can’t stop the world, and you can’t get off’; one should better start running without looking back because the world turns but ‘not for fools’. This is followed by The Runes. The song describes a situation ‘where the crosses grow’ and ‘where the runes are sown’, which seems to mean where the seeds of the future warriors are sown. The song seems to be addressed to the singer’s son, asking him to ‘be brave, march from the cradle straight to the grave’ because ‘you’re expendable’. The reaper is here and ‘he has to reap’, kill everybody and then plenty more. Children ‘scream on the bayonets of America’s dream’: again, as in previous songs, murder and destruction in the present will result in future murder and destruction. The former is taken for granted – there is nothing to do about it – the future mayhem is celebrated. To underline the unworthiness of the present world, the lyricist adds: ‘The new fashion, it’s a shroud, discordance on a mushroom cloud/ our way of life that’s all over/ the new drink is vodka cola’ (this was recorded in Japan…). This is followed by a rendering of an actual folk song, Twa Corbies (two ravens, a Scottish ballad that is in fact a nice song). Again, this is about ravens eating dead bodies (here a slain knight) but in stark contrast to Sol Invictus’s self-penned Ravens Chorus, this one has the wicked humour of an actual folk song: the ravens point out that the slain knight has been abandoned by his hound, his hawk and his mistress, so that they will be undisturbed in feasting on the dead body which they plan in some detail. It is unclear why Sol Invictus chose to include this song, except that it is about ravens. This is followed by another protest song: Media. This one elaborates on the two-classes theory indicated in Against the modern world, according to which the world consists of happy slaves and ‘financiers’. Here the picture is slightly more complex: we are asked to note ‘a world of tanks, ruled by a world of banks’, while ‘the media’ divert attention from these two ‘worlds’: lies are broadcast ‘from Wall Street to your heart’ via ‘Neon Hollywood’. Watching TV makes us ‘forget the chains of debt’ (welded by the before-mentioned financiers). ‘The masses’ are ‘ugly and dumb’ and fail to appreciate nice food, ‘lapping prole food in the sun’, bleating like sheep. The chorus is again somewhat unclear: ‘And there’s nothing I can say’ – does this mean this poet is lost for words? This does not seem to be the case; or does it mean he (obviously neither part of ‘the media’ nor the ugly and dumb ‘masses’) is not (yet?) in a strong enough position to intervene and speak truth to power? We don’t know. The last song here (apart from a live version of Raven Chorus and a seven-minute instrumental track) is called Abattoirs of Love. This song consists of a series of images that are not connected in any way that would allow one to make much sense of them; it is clear enough, though, that love is somehow associated, or equated, with death (hence: abattoirs), it is ‘a game for fools’, it ‘chains you to the floor’, and somehow love is also like being ‘in the serpent’s jaws’ (which gives the CD its title). It is not quite audible but the author/singer also seems to have been kissed by the serpent whereupon he froze. Love does not seem an entirely positive kind of thing here, all in all. This song does not contain any references to ‘financiers’ and other key features of ‘the modern world’, though: it seems a statement on love in general, not just modern love. This would make sense if it is assumed that Sol Invictus are oriented towards – what they believe to be – pre-Christian, aristocratic warrior-values of honour, revenge etc. : love is obviously not a feature of the fascist utopia. That is that. This writer’s curiosity is more than satisfied; carefully listening to what Sol Invictus actually sing about pretty much tells you all you need to know about what they are. Unless Wakeford actually distanced himself from the most defining album of his career, there is no reason to assume that he changed his mind about any of the things that are clearly stated and expressed on ‘Against the Modern World’ and ‘Sol Veritas Lux’. I have not listened to any of the countless albums that followed (and I don’t think I will…) but it seems that judging from a quick glance at some of their lyrics Wakeford very much toned down his writing, becoming more ‘lyrical’ in a traditional sense, with much less sloganeering, while continuously making references to his own earlier songs: Sol Invictus lyrics always remind one that most other people are idiots and swine, the world is wrapped in chains of gold, we are ruled by liars, while ‘Europa’ is still calling somewhere, there are wolves howling in the ruins, etc etc… this is still the same ‘apoliteic’ music of the interregnum, the waiting period imposed by the fascist defeat on Europe’s (spiritually) invincible warriors. Wakeford does of course not need to write again Against the modern world – it is there, it just needs to be referenced. Do we think this stuff is too ridiculous, backward-looking and poor quality to be of any relevance in coming crises? Well, yes, hopefully. On the other hand, fascist and quasi-fascist rackets are rising in many parts of the world, so there is no reason to be smug like a liberal. 2 Wakeford translates the name of his band as ‘The Unconquered Sun’, which is also the title of a booklet containing song lyrics published by Sol Books (London 1989). ‘Invictus’ can mean both ‘unconquered’ and ‘unconquerable’ or ‘invincible’, but as epithet for the sun only the latter makes sense. 3 Just to avoid misunderstandings: ‘fascist’ does not simply, and not necessarily, mean some kind of racist thug, street-fighting homophobe etc. Soft-spoken, well-mannered fascists who don’t mind gays and might even get married to Jews are not unheard of (although such antics might still make most of their comrades feel a bit uncomfortable). A handy primer on fascism is this short text by Umberto Eco at http://www.nybooks.com/articles/1856. For proper studying: Roger Griffin’s edited volume International Fascism: Theories, Causes and the New Consensus, London 1998, and another edited volume by Costa Pinto, Rethinking the Nature of Fascism: Comparative Perspectives, Basingstoke 2010. 4 ‘Sol Veritas Lux’ obviously translates as ‘Sun Truth Light’, which does not mean much beyond sounding pompous. The idea that the sun is the light of truth, which would be ‘sol veritatis lux’ in Latin, is a theological notion shared by Christians with Roman and other heathens. Imperial Rome soaked up all kinds of cultural influences from anywhere, and the notion of the Invincible Sun, Sol Invictus, might well originate from ancient Syria or Egypt, like so many others, Christianity included which is just another product of Imperial Roman culture-blending. The European civilization as whose defender Wakeford seems to see himself is in reality a wild mixture of many criss-crossing bits and pieces that somehow caked together through myriads of random acts of translation, assimilation, misunderstanding etc., which is the ordinary stuff of human culture everywhere. Apparently Wakeford refers to ‘Europa’ (sounds Latin, i.e. good) as Europe minus Christianity (evil) – hilarious. 5 The lyrics as printed in the 1989 booklet read differently: ‘from their dustbin worlds they crawl’. 6 The 1989 booklet has ‘We’ll watch the Angels as th[e]y fall’ which makes more grammatical sense. 9 The lyrics of the a capella bit are neither given on the cd nor the booklet. They are: ‘The old raven stands amid the battle dead/ He pecks and gouges, pulls and tears/ And soon stands proud and fed/ You raven with your night black sheen/ You raven with your beak/ I see the end of my comrades/ And I choke and I cannot speak’. I could not figure out where this stems from. 10 see Shekhovtsov as above footnote 7. 11 In the middle ages, the church would have defined what a ‘just price’ is; in modern times, either ‘the market’ or the authoritarian state do so. Unless one wants clergy or the state to do the ruling, there is no point in complaining about ‘unjust prices’. The exploitation that inheres also in ‘just prices’, ‘fair wages’ etc. can only be overcome by abolishing the commodity form along with state, religion etc. as this this website conations genuinely nice funny stuff too. Except for the phrase “They rule the European land”, the lyrics for “Wolf Age Axe Age” are lifted straight from Snorre Sturlason’s “Edda”, so it’s a 13th century text.